LEAVE YOUR MARK isn’t a book of advice — it’s a mentorship in 288 pages. Aliza Licht– global fashion communications executive, AKA fashion’s favorite ‘PR girl’ and former Twitter phenomenon– is here to tell her story, complete with The Devil Wears Prada-like moments and insider secrets. 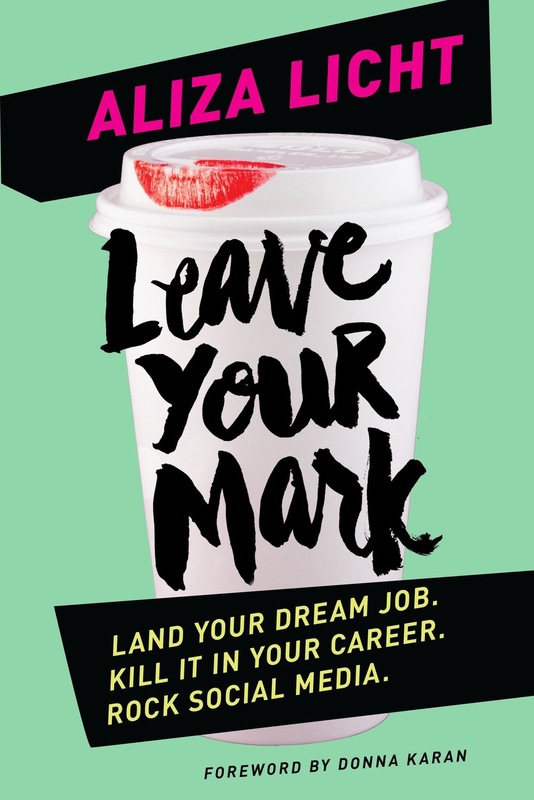 Drawing invaluable lessons from her experience, Licht shares advice, inspiration, and a healthy dose of real talk in LEAVE YOUR MARK. She delivers personal and professional guidance for people just starting their careers and for people who are well on their way. With a particular emphasis on communicating and building your personal brand, something she knows a thing or two about, Aliza is your sassy, knowledgeable guide to the contemporary working world, where personal and professional lines are blurred and the most important thing you can have is a strong sense of self. Leave Your Mark is exactly what it says it is. It’s a social media, PR, fashion, and marketing mentorship all rolled into one. Broken into easy sections that chronicle Licht’s career, it’s fun to read about her career evolving. As someone starting out in the industry, Licht’s story was very inspiring and made me want to push myself and gain more job experience. Licht details the hard work that she put in to get where she is now, which shows how much effort anyone in the PR and marketing industry has to put in. The book is both a reality check and incredibly motivational. I enjoyed how she incorporated lots of witty quips and personal stories to make you feel a connection with her journey. The book is split into three main parts, making the small book seem even less daunting. Within each section, Licht has created lots of easy-to-read lists describing tips and steps for success. I don’t know if I’m the only one but I truly adore lists; they turn what could be daunting paragraphs into easy bite-size chunks of info. The only thing that I felt was missing from the book was further detail on how she went from her starting position at DKNY to her current position at DKNY. This would have been especially useful for anyone already in a starting position at their dream company but looking for more tips on how to move up. I would highly recommend this book for anyone entering university, currently in university, or recently graduated and beginning their career. It was a very fun and inspiring read that I will continue to revisit when I need to motivate myself. One of the drawbacks of the book is that a decent amount of the information is pretty basic, so it may be interesting but not as insightful for readers with more career experience.